Sumi-e painting is a beautiful medium that is rich in art history and culture. Calligraphy is a form of writing in Asian cultures that has been taught for thousands of years, this artistic form of writing eventually developed into pictures-the art of Sumi-e.
Students understand that artists use line to create 2D works of art. They review five types of lines and line qualities. Students will learn about Sumi-e painting history. The will understand how calligraphy developed into the art medium of Sumi-e. 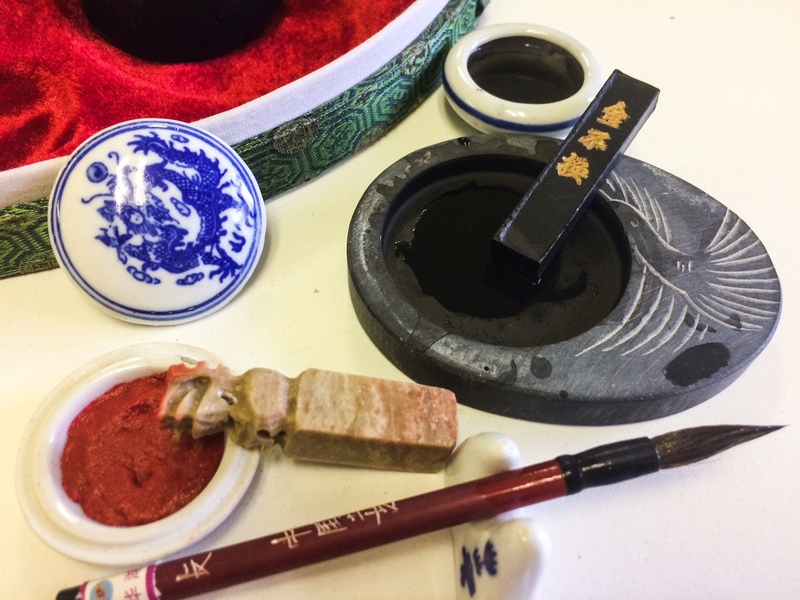 Learn and create art using the Four Treasures of Chinese Brush Painting: Ink, slate, brush, and paper to create a Chinese brush painting. Calligraphic Line is line that varies in width. Sumi-e refers to any ink painting derived from traditional Asian brush techniques. Around 1100-1275 AD, Zen Buddhist monks took ink painting to Japan & other parts of Asia.Today ink painters can be found all over the world. The art of Sumi-e originated in China about 6000 years ago as Calligraphy. Calligraphy led to painting pictures. The 1st ink painting on silk dates to about 200 b.c. The “4 Treasures”: The essential materials used for Sumi-e are know as the Four Treasures or Four Gentleman. Ink: Ink comes in 2 forms: Stick & Liquid.The Stick is made from pine or oil carbon & glue. Most sticks have some type of design on them. In the past, gold leaf or precious stones were embedded, making it very valuable to use. Brush: Bamboo Brushes are usually made of Sheep, Horse, weasel, boar or a synthetic hair. The vein is made of bamboo. Ink Stone: Ink stones are used with grinding ink sticks.They can be simple or have elaborate carvings. Water is placed in the well of the stone, then the ink stick is pressed back & forth until the desired value is reached. Some stones have extra wells for creating different values. Rice Paper: It is not made of rice. It is made from a variety of plant materials: sandalwood, bamboo, mulberry, cotton & linen. Washi: Japanese Paper made from bark, trees & shrub. If you choose to use ANY part of this blog (pictures or written), please link back to Create Art with ME!